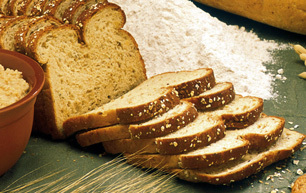 Acrylamide can be found in starchy, cooked foods like bread. Acrylamide is a chemical compound used to make polyacrylamide materials for use in drinking water and waste water treatment. It's also used in glues, paper, cosmetics, oil wells, organic chemicals and dyes, ore processing, herbicides, dam foundation and tunnel construction. It can be found in foods cooked at very high temperatures, especially starchy foods like breads and potatoes, and in coffee. It's believed to form as a result of the Maillard Reaction—a chemical reaction that produces browning. There are currently no acceptable means of detecting or removing acrylamide from drinking water.